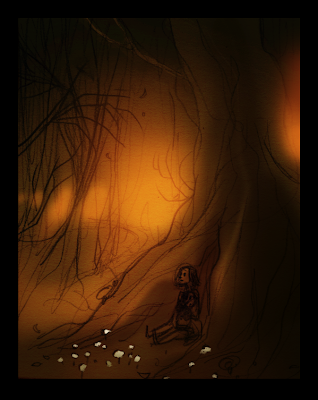 Hansel and Gretel is a story I've always liked. 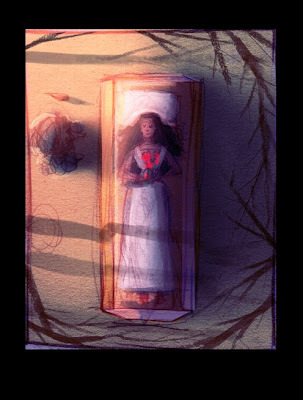 It's scary, it's about abandonment, and it's the story of a (step)mother wanting to leave her (step)children for dead -- but in the end a little girl shoves a witch in an oven and rescues her brother. I appreciate the moral clarity. And depending on the version you read (or vague interpretation) the witch is the (step)mother. That is terrifying. Out of all of my pieces for the show this is the one without any fantasy elements. It's simply a brother and sister lost in the woods. (Something Erin pointed out last night too, my show divides neatly between five well-known stories and five lesser-known stories.) I didn't plan it that way but I'll take it. The story for me is really just about a brother and sister overcoming a terrible situation on their own. In real life my own little sister and I have been through a few things, here and there. Truthfully, this piece is more about that than about Hansel and Gretel. Hansel keeps watch while Gretel sleeps, or it might be better to say Hansel keeps watch so Gretel can sleep. If it's been unclear, heretofor, none of the work I've posted yet is a finished, final piece. There are final drawings and final under-painting but these are all just steps in the process. In production news, I'm on track completing the final watercolor under-paintings tonight. Mark your calendars, April 3rd, 2009. Be there! I'll be posting a poster with all the important information as the show date draws nearer but even so, I do sincerely hope you'll pencil in a visit. Next post : The Nine Pea-hens, or why it's stupefyingly difficult to follow Arthur Rackham. 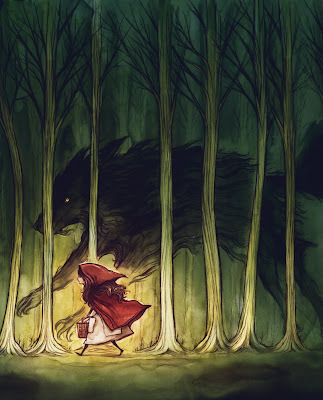 I knew for sure when I first started planning "Grimm and Other Folk Tales" that I'd be revisiting Little Red Riding Hood. 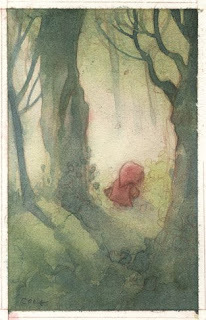 This is a small, old watercolor from about seven years ago. 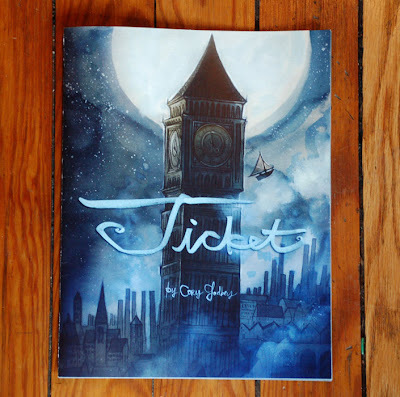 I love stories where heroic innocence beats something really bad. In the ones I really love there's no real danger. Nothing is going to hurt them. Max? He's the King of All Wild Things and though "they roar their terrible roars" they can't touch him. That's not to say nothing happens, or there's nothing bad, dangerous, or perilous; whatever you'd like to call it but even in the scariest, worst place you know that something good will happen, not because you hope it will, but because it has too. The woodchopper is coming. Whether it's Max in Where the Wild Things Are, or Little Red, there's something about the naïveite of the hero that resonates with me. Good will work out simply because it's good. Even more than the innocence of the hero (or heroine) , I love the woodchopper; whatever form he takes. 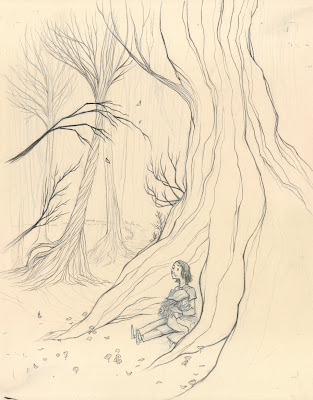 It touches on the theme we talked about a couple posts back with Snow White, J. R. R. Tolkien's concept of "eucatastrophe" -- a good catastrophe, a sudden turn of events in which the outcome is joy, not sorrow. 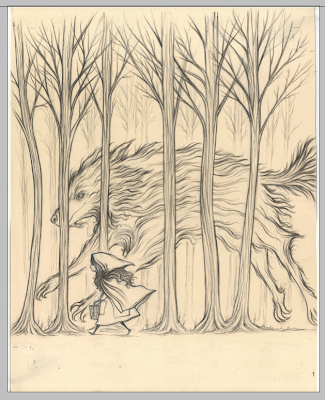 I might be stretching it a little far maybe, with Little Red Riding Hood, tying it to Tolkien's quote, considering the origins of the tale and ways one might interpret it, but still I believe good will work out simply because it's good. Well, enough of that, on to the work. 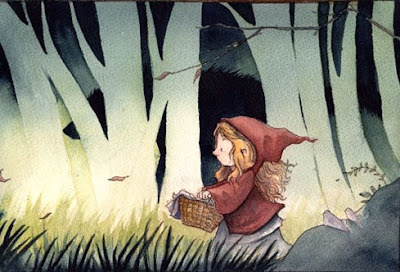 Something like 7 or 8 years ago I did a painting of Little Red Riding Hood. Behold. I ended up giving the painting to Justin who liked it a great deal and still talks about it. I took the idea of the old Little Red painting and applied what (hopefully) I've learned in the intervening years and made a stronger piece. the rough, the color comp. One thing I do like about the old one that's missing from the color comp. is the lightness of the trees and gradation of darkness from the top to the bottom behind them. I'll have to apply some of that logic when the time comes to finish this. 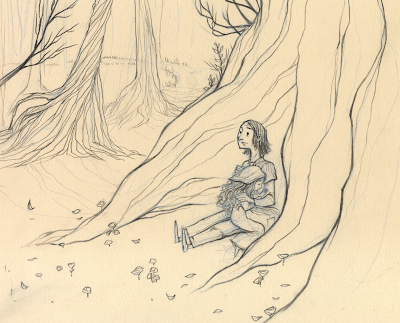 Next post : Hansel and Gretel, or a lot of a lot of trees and two little kids. "Then the king put in a word, and said, 'Each of you is right; and as all cannot have the young lady, the best way is for neither of you to have her: for the truth is, there is somebody she likes a great deal better. But to make up for your loss, I will give each of you, as a reward for his skill, half a kingdom.' So the brothers agreed that this plan would be much better than either quarreling or marrying a lady who had no mind to have them. And the king then gave to each half a kingdom, as he had said; and they lived very happily the rest of their days, and took good care of their father; and somebody took better care of the young lady, than to let either the dragon or one of the craftsmen have her again." 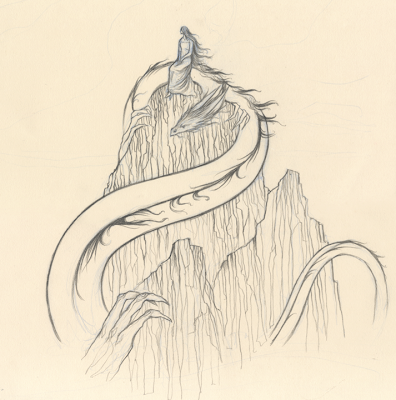 "There they found the princess sitting, as the star-gazer had said, on the rock [island]; and the dragon was lying asleep, with his head upon her lap." That's just way too cool so it was the moment I went for. One small detail I changed was the dragon resting its head in her lap. It obscured the princess too much. I hope to not get a call from Jakob and Wilhelm over it. That would be an awkward conversation. An admittedly rough painting, however when my ultimate goal is for digital work I treat the watercolor much more like an underpainting and just look for textures and some values. I scan the drawing first of all so I've got it and then I paint the drawing. This is a way I've found works well under a deadline and gets me what I am looking for. I'm usually not so concerned with color at this point, some local color but when I know that soon I'll be painting digitally I tend to focus my time on the texture and actual paint-ness of the paint. 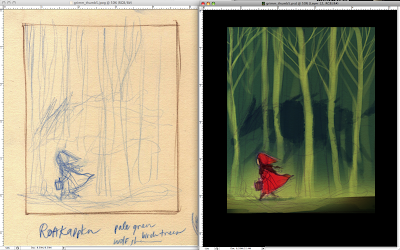 Next post : Little Red Riding Hood, or my fascination with an old composition. 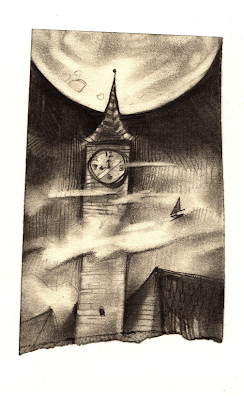 As I mentioned in my last post, I've begun final work on "Grimm and Other Folks Tales." I can honestly tell you that I've never been more proud of work that I've been able to do so far. I wanted to pass along some of that work, the second piece I thought of but the first one I set in order. There are ten pieces in total and I don't know if why but there's an order to them. Maybe not for anyone else but they seem right to my eye in a certain order. 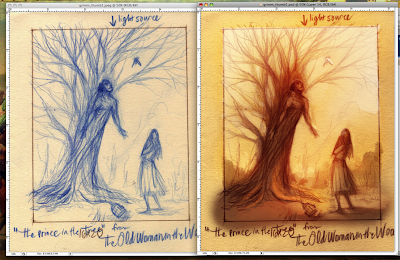 So, here's the first from thumbnail, rough, color comp, to finished drawing. A poor servant girl traveled with the family she served when robbers attacked them. 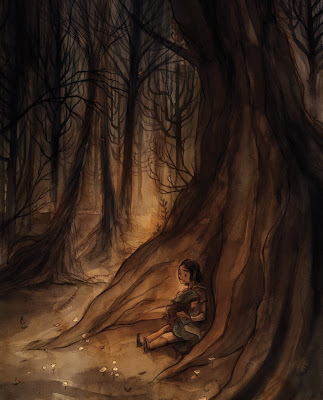 She hid behind a tree, but no one else survived. She lamented her fate, and a dove came to her, with a golden key. It told her to unlock a tree, and she found food. In the evening, it brought her another key, for a tree with a bed. She lived like this for many days, when the dove asked her to do something for it. She agreed. It told her to go to a house and go in. An old woman would greet her, but she should not answer; she should open an inner door, which will reveal a room full of splendid rings, but she should take a plain one. The old woman was quite angry, but the girl did not heed her. Then, when she could not see the plain ring, she saw the old woman trying to carry off a bird cage. She took the bird cage away from her; it held a bird, which held the plain ring in its beak. She took it outside and waited against a tree. 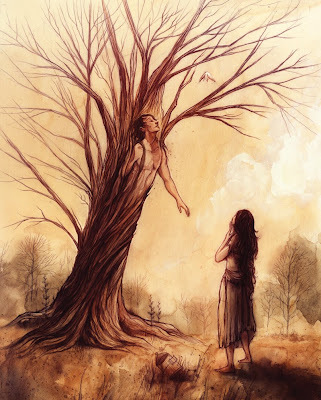 Two branches turned into arms about her as the tree turned into a handsome man who kissed her and told her that the witch had turned him into a tree, and for two hours a day, a dove, and she had freed him. All his attendants turned back from trees as well, and he being a king's son, they went to his father's kingdom and married. Work goes very well on the show. I have all of my under-drawings done and I have the final drawings done for 6 of my 10 pieces. My goal is to be done with the drawing by the end of February. Next post : Schneeweißchen, or Snow White. Wow, I just noticed that with my last post I just rolled up on 700 posts. That makes around 3 and a half years of posting, 700 posts... so, if my math suits me, that would be around 1200 days. Celebrate! I am feeling very good. I've been hard at work on my upcoming show, Grimm and Other Folk Tales. And I now have a date confirmed, April 3rd. Of course I'll make much more mention of this when we draw nearer to the actual event. In other news one of the reasons I am (doubly) pleased and ready to celebrate is that today marks the 2-week anniversary of my debilitating shoulder surgery. Yes, I am right handed and my surgery was on my right shoulder. The short story is I've dislocated it so many times and had so many ER visits that a (second) surgery became necessary. What's good about this you ask? Well, I'm at the 2-week mark and I'm finally back to work. I finally feel back into the swing of things. No, the pain isn't all gone, and yes there are occasional moments that make grit my teeth when I move weird, but I am working. And that's what matters to me. I'd like to show you another one of my 10 pieces for my show, another rough color comp. 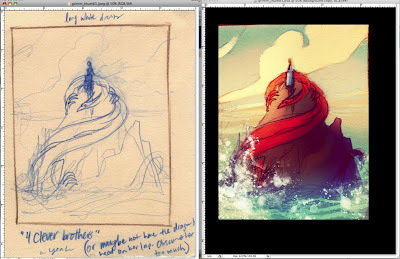 If you like you can get a small peek of the other thumbnails (and also get glimpse into my production) here. 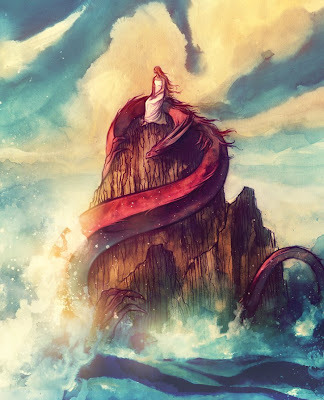 "I see her afar off, sitting upon a rock in the sea, and I can spy the dragon close by, guarding her." The story is called "The Four Clever Brothers." If you like you can read it here. 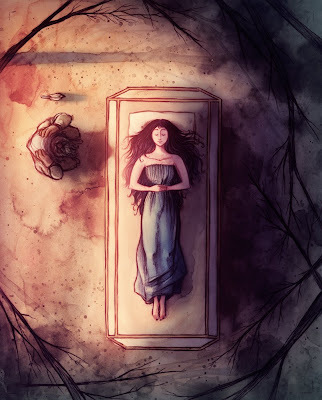 The moment I chose to illustrate is the princess who has been kidnapped by a dragon and taken to an island. I've made it through the first 6 drawings this evening, done my under-drawings. I do an "under-drawing" with a light blue pencil, figure out my drawing pretty thoroughly before I come back in and finish the drawing. It helps me to not come to a blank page to start and I try to resolve the work ahead of time and let myself enjoy the act of drawing. Thanks for stopping by. More to come! I've been at work the last couple days, working, using my arm in a sling and generally making myself look funny to my co-workers, but it is possible to work with limited motions in a sling. A sort of stupid looking physical therapy. But it's working, I am getting more movement back. Here's the first thing I doodled when I got back. 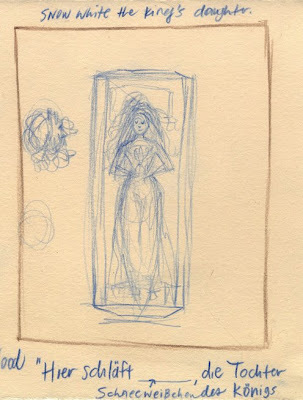 And poetically, it's on the same piece of paper that I drew one of the last things I drew before surgery; notice the edges, it's some extra grass for Esther's album cover. My motion has been limited the last few days. 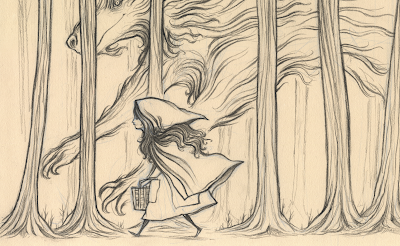 I haven't been able to start final drawing work on the Grimm show yet but I feel up for it tonight. My schedule for the show is, naturally, compressed but I've got a decent working schedule planned and if I hit certain dates everything will be fine. I'll keep you posted. Though I still have incredibly limited range of motion in my right shoulder, I have seen my movements develop over the last few days from "not at all" to "a little tiny bit." That is encouraging for me, and not only a sarcastic encouraging. I return to my surgeon Wednesday to (likely) enjoy a harrowing game of "doctor maintains eye contact, calmly talking, and suddenly jerking the stitches out." We'll see. I always loose that game no matter who I play it with. In all likelihood however, I believe that this week I'll hit that magic point where I can move my arm just enough with just enough of the discomfort under control to begin final work on Grimm and Other Folk Tales. My process for these next few pieces has been quite unlike much my previous work. With these pieces I've tried, at every stage, to lay as much foundation as I can and approach each piece with the best understanding of the story, composition, color theory, and physical reference as I can. I spent about 2 - 3 weeks reading through different compilations of Grimm fairy tales, a book of Swedish folk tales, and several fairy tale books by several different writers and illustrators. I dug through the rich tradition of fantasy art and (naturally) fairy tale art created by some of the greatest painters : Arthur Rackham, Edmund Dulac, Kay Nielsen, and John Bauer, especially these artists. 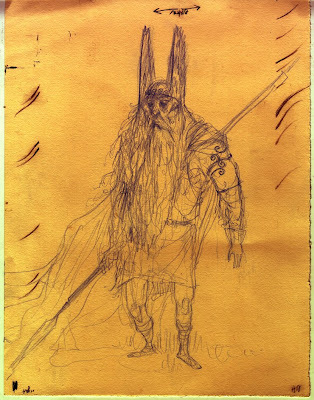 I love their use of line and shape, and specifically Rackham's use of color. During those 2 - 3 weeks I began selecting which stories I wanted to paint. I re-familiarized myself with stories I knew and discovered several dozens more that I had never heard. Finally I settled on a range of pieces arching from more familiar stories like "Hansel and Gretel" and "Snow White" to more wild ones like "The Giant Who Had No Heart in His Body" and "Dag and Daga" -- stories I'd never heard of yet unlike some others that I'd never read before that were just bizarre, some of these stories had amazing illustration opportunities that I haven't seen done before. 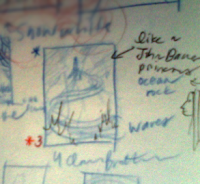 I took the next week and devloped thumbnails for around 15 of these stories. 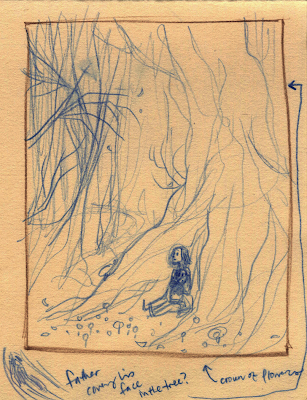 Generally my method of storyboarding or thumbnailing is to scribble an inch by inch square or rectangle, scrawl my quick idea, and deal with the finer points of the compostitions later. I took these a step further and took the finished size of the pieces (16 in x 20 in) and scaled that down to 4 x 5 and drew more "finished" roughs and forced myself to be a lot more mindful (and less lazy) regarding the compostions. Next, I worked up very (for me) finished color comps. Now this next step sought to correct some of the biggest problems with my process, that problem being my lack of reference. It usually comes back and bites me. 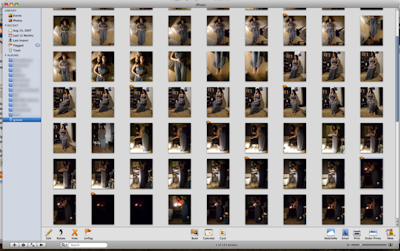 The night before my surgery I spent about an hour with my sister-in-law Julia and shot tons of reference. We took something like 200 pictures. So with all this in place you can imagine that I'm ready to get back on this. My week recuperating has been relaxing; as relaxing as a one-armed, medicated vacation could be, but I am very ready to get back to it. I'm pleased that all this work still holds up after a week of sitting. That's more encouraging to me than most anything else. dispatches from the edge of madness. Well, not too much madness anyway. I think the medication has kept my cabin fever at bay for the time but we are fast approaching one week of having been wrapped up however, that's getting close. Here's a quick update; the surgery went well, I have a couple anchors in top of my humerus and hopefully this will hold everything together. For the most part I've been sleeping, playing Worms on wifi (and destroying my competition) and drinking through a straw. I'm fully capable of drinking like an adult but let's face it -- straws are fun. By Justin and my fellow Portland workers. We always joke about getting a gorilla arm for me. By neighbor and friend Andrew Ramos. Who knows how badly I want a Terminator arm. I've gotten some movement back in my arm. My hand I can move and my wrist I can move but I can't move my arm too well, not much up or to the side. You may rest assured I am working on that. All that to say work on Grimm and Other Folk Tales has paused a few days (as planned, I built recovery into my time budget) I've gotten all my work together and I shot all of my reference before surgery and completed all of my 4 in x 5 in thumbnails and color-comped them.